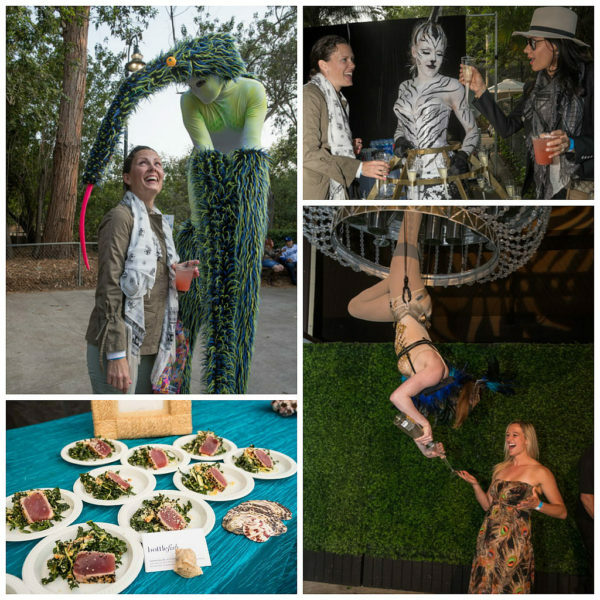 The Annual Beastly Ball hosted by the Greater Los Angeles Zoo Association (GLAZA) is an event in which all the beasts – the denizens of the zoo, and the guests – have a ball together. During its 48 years, the event has become a jewel in Los Angeles earning the distinction as one of Southern California’s Top Events of 2018 from BizBash magazine. Images by Lighting has been honored to have been lighting LA Zoo’s Beastly Ball for 32 years! 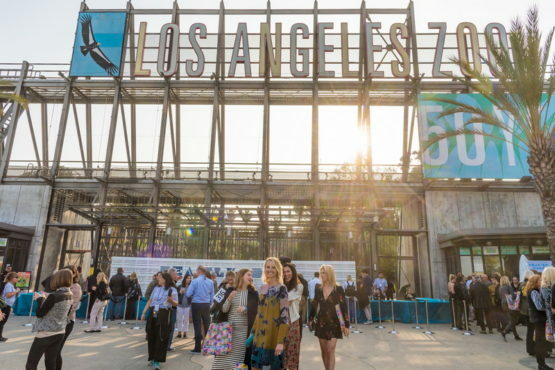 A sprawling event in which guests meander throughout some of the most popular areas and exhibits, the Beastly Ball has helped make the LA Zoo an international leader in wildlife preservation and education. This year alone the more than 1,000 guests helped raise almost $1.5 million through ticket sales and a silent and a live auction. The event has evolved through the years, becoming more sophisticated thanks in part to its planner’s responsiveness to suggestions from patrons and guests. Melissa Grossenbacher, Associate Director of Special Events at GLAZA, is one who has seen several big changes happen in the past two years since she joined the team 11 years ago. The team also listened to its long-time patrons to create more points of interest along the event path where everyone could meet up. “Now there are two main hubs and we focus most of our activity there,” Grossenbacher says. 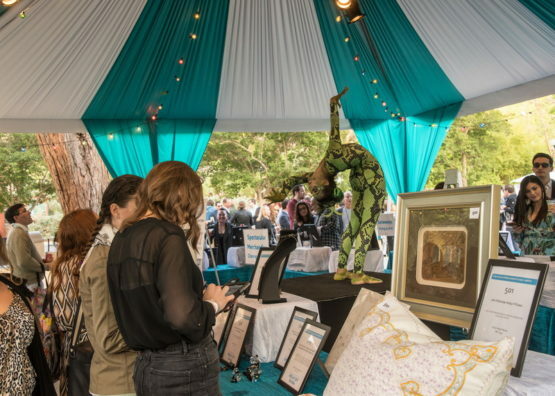 At both hubs are silent auctions, food stations and experiential entertainment such as stilt walkers, a champagne chandelier with an aerial bartender, contortionists, and a mural photo opportunity. But the main attraction comes at the very end of the path, so to speak. At 8 p.m. all roads lead to the concert area for coffee, dessert and a live auction and a concert. This was also a new change. 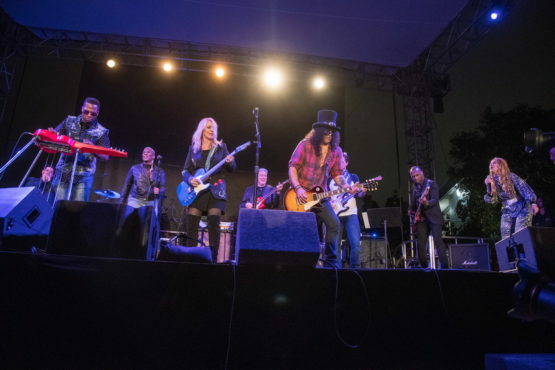 Started in 2017, and The Concert for Conservation brings in big-name entertainers, many of whom are also GLAZA trustees such as the guitarist Slash. This year he was part of a lineup that included Nancy Wilson and others. And it all works. The animals seem as happy as the Zoo’s experts who are standing by to answer questions for the guests or hold certain animals and reptiles to let the guests get closer to them. And then there are those many magical moments when guests are transported to a far-off land. This year that happened at the viewing area for the elephants of Asia Cambodia. There, as rays of sunlight broke through the clouds, guests enjoyed watching the elephants as the sitar music of Ronobir Lahiri connected the past with the present and Los Angeles to the larger world. Jack Hanna, the night’s honoree who has dedicated his life to animal issues, said it best – “A zoo is an ark.” Certainly, the Los Angeles Zoo has become known for protecting some of the most critically endangered species on the planet. Every year at the Beastly Ball, guests have the honor of boarding that ark to learn more about them. They leave with the sense that it isn’t just wildlife we need to preserve, but our own connection to that world, and understanding that we too are part of it.